Generate hilarious messages with Markov Writer. 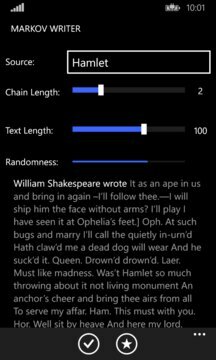 This app uses Markov chains to complete your sentences in the style of various authors including William Shakespeare and Jane Austen. The result is a bit like an automatically-generated mad lib. Adjust the parameters to fine tune the text generation and then share the funniest messages with your friends.